May. 23, 2016 | LITTLE ROCK — Sheldon Riklon, M.D., one of only two Marshallese physicians in the world who was trained in the United States, is joining the University of Arkansas for Medical Sciences (UAMS) Aug. 1. Sheldon Riklon, M.D., (second from right) is joining UAMS on Aug. 1. He is shown with Pearl McElfish, Ph.D., director of the Office of Community Health and Research; Stephanie Gardner, Pharm. D., Ed. D., provost and chief academic officer; and Peter Kohler, M.D., vice chancellor of the UAMS northwest Arkansas campus. Riklon will serve as an associate professor in the UAMS College of Medicine’s Department of Family and Preventive Medicine and as the inaugural holder of a Distinguished Professorship for Health Disparities. He will be based at UAMS’ northwest Arkansas campus in Fayetteville. He will also oversee residents at the UAMS Family Medical Clinic-Fayetteville, and will treat patients at the UAMS North Street Clinic and the Community Clinic’s Springdale location. 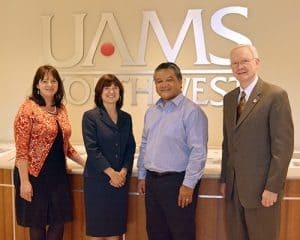 UAMS North Street Clinic is a student-led free clinic on UAMS’ northwest Arkansas campus for Marshallese patients with diabetes. There are approximately 11,000 Marshallese in northwest Arkansas, the largest population outside of the Marshall Islands. About 50 percent of the Marshallese in northwest Arkansas has diabetes. Riklon joins UAMS from the John A. Burns School of Medicine at the University of Hawai‘i at Mānoa, where he is an assistant professor and the family medicine clerkship director in the Department of Family Medicine and Community Health. He was recently inducted into Alpha Omega Alpha, the honor medical society at the University of Hawaii. He received both his bachelor’s degree in biology and his doctor of medicine at the University of Hawaii.